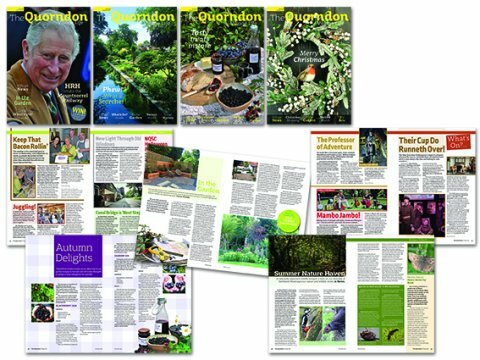 The Quorndon magazine, which is printed in full colour and generally contains between 76 to 80 pages, contains a wealth of news items about Quorn Village and surrounding areas, a What’s On section, Charity News, a Clubs and Societies Guide, along with specially created, original features such as The Arts, Food and Drink, Gardening, Nature and Wildlife, Local History, Health and Fitness. The magazine aims to have an equal balance of interesting and original editorial content and advertisements and as such is widely enjoyed by readers of all walks of life. The Quorndon magazine can also be found on Facebook and has a strong following. The magazine accepts advertisements from advertisers within Quorn, neighbouring villages and further afield. 3750 copies of The Quorndon are printed four times a year and distributed FREE to most homes and businesses in Quorn, Cropston, Rothley Plain (which includes Swithland Lane, The Ridings, The Ridgeway and Westfield Lane), Newtown Linford, Swithland, Old Woodhouse, Woodthorpe and to selected venues in Charnwood and the Soar Valley. If you wish to write a letter, contribute an article or place an advertisement, please use the contact details below.